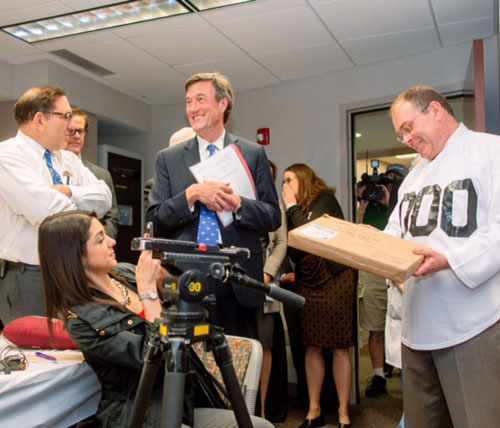 Colleagues surprised Charles Rosen, M.D., with a celebration recognizing his 1000th liver transplant, including some lighthearted gifts in line with the theme. In true Mayo fashion, he was quick to turn the attention to the team and the donors. Charles Rosen, M.D., a Mayo Clinic transplant surgeon, is having a pretty good year. First, he helped make Mayo Clinic history in early March as part of a team that performed five liver transplants in a 24-hour period. Dr. Rosen was back in the news again last week after completing his 1,000 liver transplant at Mayo Clinic. To mark the milestone, a group of colleagues organized a surprise celebration, the Rochester Post-Bulletin reports. They lavished him with gifts, such as a "signed pillow in the shape of a liver," a sports jersey with the number "1,000" on it, and the board game Operation. "We had this when I was a kid. It kept buzzing all the time," he quipped. (We find that a little hard to believe.) 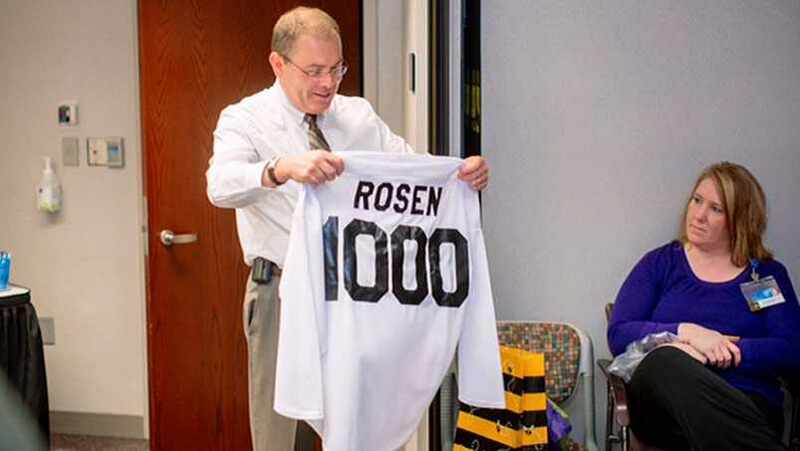 Dr. Rosen, the newspaper reports, in true Mayo fashion, was quick to turn the attention to the team around him, and to the donors who have made each transplant possible. "This is hardly something a person does alone," Dr. Rosen said, adding, "We should never forget the donors and their families … it's the one good thing that can happen from a tragic situation." The P-B reports that Dr. Rosen has been a transplant surgeon at Mayo since 1991 and has done "all but 160" of the liver transplants in Rochester. And even though the United Network for Organ Sharing doesn't track individual statistics, the newspaper reports that likely puts him on a short list of "highly resilient performers" in the "complex, unpredictable" world of liver transplants. But good luck getting him to acknowledge that. "Most of my surgical colleagues are doing difficult, different operations all day long," Dr. Rosen says. "We are doing one thing every time." Be that as it may, Dr. Rosen's colleagues, including fellow transplant surgeon Julie Heimbach, M.D., and Brooks Edwards, M.D., director of Mayo's William J. von Liebig Center for Transplantation and Clinical Regeneration, say not to let that fool you. "It's a very technically demanding procedure, it requires full concentration, and it's a physical surgery, usually about four to six hours," Dr. Heimbach tells the paper. "You do the surgery when the organ becomes available. You work more often in the middle of the night than the day." Dr. Edwards notes that even though Dr. Rosen is quick to focus on the "team sport" aspect of liver transplants, he is an "inspiring" surgeon to both watch and work with. "Every patient is an individual to him, and he cares for every patient like a member of his own family," Dr. Edwards tells the paper. "He lives the Mayo creed, that the needs of the patient are the only needs to be considered." You can be the first to let us know what you think by sharing your thoughts below and by sharing this story with others.